The time-traveling Lady Pendleton and her family welcome you to Christmas 1811 at the Pendleton estate in Wittersham, East Sussex. Present are: Lady Julia Tate, her eldest daughter; Lady Philippa Bland and her husband George, Viscount Hooper; Lady Sarah Newsome, her husband Sir Henry Newsome, and their two daughters, Emily (2) and Theodora (3 months). 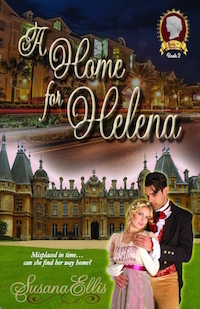 Note: Julia’s sister Lady Sarah and her family feature prominently in the sequel to An Ultimate Escape, which is titled A Home for Helena (available soon). 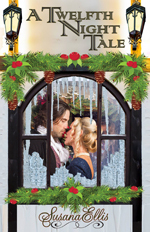 To win a digital copy of Lost and Found Lady and a lovely perfumed frame and cameo, mention (1) your favorite Christmas film and (2) the name and title of the hero of Amy Rose Bennett’s story in Mistletoe, Marriage, and Mayhem in the comments below (one random commenter will be chosen). 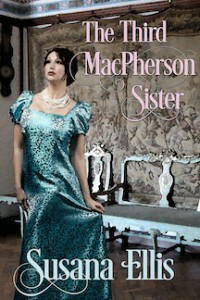 The answer can be found on her post here: http://amyrosebennett.com/the-bluestocking-belles-holiday-wassailing-tour/. 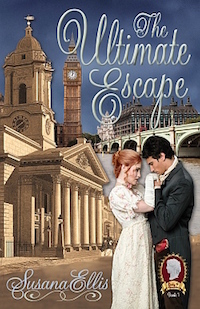 Lady Pendleton, her daughter Julia, and Oliver Stanton are characters in The Ultimate Escape, a time travel novella in Mistletoe, Marriage, and Mayhem. Christmas 1810 had been a sober affair, the Pendletons’ first without their beloved patriarch’s gentle humor. A year later, however, his wife and daughters had recovered from their grief well enough to feel his spiritual presence in their lives. 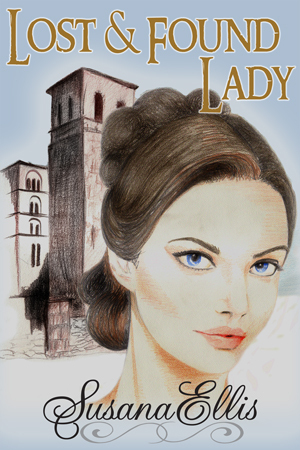 Lady Pendleton and her youngest daughter exchanged a glance. The rivalry between Julia and Philippa had become routine in their family, even after they had become adults. Philippa gave Julia a look of annoyance and moved to the pianoforte. “What song shall we begin with?” she asked, deliberately ignoring Julia’s request. Sarah’s oldest daughter was playing on the floor with a model of the HMS Victory, Lord Nelson’s ship at the Battle of Trafalgar, that her father had given her for Christmas. Her mother had lightheartedly accused him of wishing Emily were a boy, but for whatever reason, their little daughter eschewed her dolls for the colorfully-painted ship. “Emily has decided. I Saw Three Ships it is,” Philippa agreed, and played a chord to begin the singing. She’d been standing there a few minutes, beginning to feel the sudden chilling of the air through her fur-lined cloak when the door to the house opened and a stout, middle-aged woman gestured for her to come inside. Julia’s mouth fell open. They were expecting her? No, of course not. She was being mistaken for someone else. “I don’t think…” she began, but was interrupted by another, taller, woman, who unhooked her cloak and dragged her into a back room. Julia’s eyes narrowed. She’d heard enough of that nonsense in her early years. “I assure you, they did, madam, if that was the complexion they were born with.” Scrubbing them with lemon juice and taking parasols everywhere had never made much of a difference, so she had learned to accept hers gracefully. There was an awkward moment or two before she learned that “the Regency” was the period from 1811-1820 when the Prince of Wales ruled as his father’s proxy until the king’s death in 1820. The Prince had been Regent for nearly two years in her own time, but nobody she knew called it “the Regency.” And she hadn’t, of course, known the date of the King’s death. That caused a tear or two until she realized suddenly that he had been dead for nearly 200 years, and so was everyone else she knew. Even she herself. Just thinking about it made her head spin. But she didn’t have long to brood, because there were visitors to talk to. And other interesting things to learn—more awkward moments—such as the name of the house—Apsley House—and its most famous occupant—the Duke of Wellington, who turned out to be Arthur Wellesley, a particular friend of her father’s who, in her time, had only recently been made a marquess. From listening to the guides of some of the groups who toured the house, she learned that Wellesley had triumphed against the French emperor in a famous battle in an obscure Belgian town called Waterloo… that he had been showered with lavish gifts from all over the world, and even become Prime Minister. How intriguing! 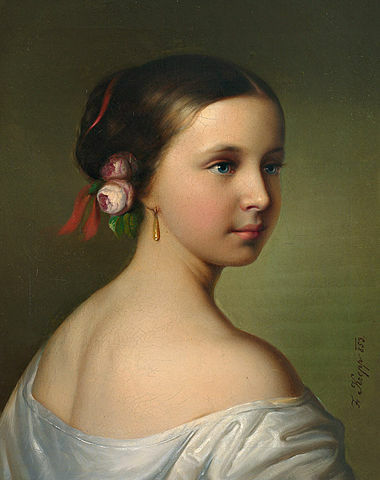 Although she found it amusing to speak with the visitors about attending balls and dinners and answering a multitude of questions about the period in which she lived, she was relieved when the young woman whose place she had taken finally arrived, and she could leave to continue her explorations of the London of the future. What else might she discover before returning to her own time? The butler placed the goose on the table in front of him, and a footman handed him the necessary utensils. First make a good standing crust, let the wall and bottom be very thick; bone a turkey, a goose, a fowl, a partridge, and a pigeon. Season them all very well, take half an ounce of mace, half an ounce of nutmegs, a quarter of an ounce of cloves, and half an ounce of black pepper, all beat fine together, two large spoonfuls of salt, and then mix them together. Open the fowls all down the back, and bone them; first the pigeon, then the partridge, cover them; then the fowl, then the goose, and then the turkey, which must be large; season them all well first, and lay them in the crust, so as it will look only like a whole turkey; then have a hare ready cased, and wiped with a clean cloth. Cut it to pieces; that is, joint it, season it, and lay it as close as you can on one side; and the other side woodcocks, moor game, and what sort of wild fowl you can get. Season them well, and lay them close, put at least four pounds of butter into the pie, then lay on your lid, which must be a very thick one, and let it be well baked. It must have a very hot oven, and will take at least four hours. Put the apples into an 8 by 8-inch glass baking dish. Spoon the brown sugar into the center of each apple, dividing the sugar evenly among them. Pour the water into the bottom of the dish and bake until tender, about 45 minutes. Pour the ale and Madeira into a large slow cooker. Put the cloves, allspice, and cinnamon into a small muslin bag or cheesecloth, tied with kitchen twine, and add to the slow cooker along with the ginger and nutmeg. Set the slow cooker to medium heat and bring the mixture to at least 120 degrees F. Do not boil. Add the egg whites to a medium bowl and using a hand mixer, beat until stiff peaks form. Put the egg yolks into a separate bowl and beat until lightened in color and frothy, approximately 2 minutes. Add the egg whites to the yolks and using the hand mixer, beat, just until combined. Slowly add 4 to 6 ounces of the alcohol mixture from the slow cooker to the egg mixture, beating with the hand mixer on low speed. Return this mixture to the slow cooker and whisk to combine. Add the apples and the liquid from the baking dish to the wassail and stir to combine. Ladle into cups and serve. To every pint of port wine, allow 1 quart of boiling water, 1/4 lb. of sugar, 1 lemon, grated nutmeg to taste. As this beverage is more usually drunk at children’s parties than at any other, the wine need not be very old or expensive for the purpose, a new fruity wine answering very well for it. Put the wine into a jug, rub some lumps of sugar (equal to 1/4 lb.) on the lemon-rind until all the yellow part of the skin is absorbed, then squeeze the juice, and strain it. Add the sugar and lemon-juice to the port wine, with the grated nutmeg; pour over it the boiling water, cover the jug, and, when the beverage has cooled a little, it will be fit for use. Negus may also be made of sherry, or any other sweet white wine, but is more usually made of port than of any other beverage. Sufficient: Allow 1 pint of wine, with the other ingredients in proportion, for a party of 9 or 10 children. Links to all of the Belles’ holiday wassailing stops, with a different Regency era Christmas carol, dinner selection, and beverage, and wassail recipes at every stop that you can make in the modern kitchen. Thank you for the recipe. It looked delicious. I think my favorite Christmas film is “Scrooge!” a musical of Charles Dickens’ A Christmas Carol. The hero of Amy Rose Bennett’s novella is Jasper, Lord Arlington. I have read about these beverages and other dishes in many regency novels and it’s great to see recipes for them. Thanks for sharing! Lord Jasper Arlington is the hero and my favorite Christmas film is Christmas Vacation. Always a hoot! Lord Arlington in Amy Rose Bennett’s story. My favorite movie is White Christmas. Lord Jasper Arlington. I love the movie Christmas with the Kranks 🙂 The hero’s name is Lord Arlington. The hero’s name is Jasper, Lord Arlington. My favourite Christmas movie is A Christmas Carol with Alastair Sim. My favorite Christmas movie would be either the Bishop’s Wife or It’s a Wonderful Life. Lord Arlington (earl), Jasper, is the answer to your other question. My favorite Christmas movie is a christmas carol. Thanks for the recipe and the snow fall on the page. My favorite Christmas movie is Elf. 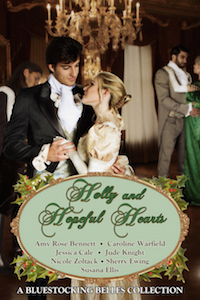 The hero of Amy Rose Bennett’s novella is Jasper, Lord Arlington. My favorite Christmas movies are It’s a Wonderful Life and Elf, The hero is Jasper, Lord Arlington. Thanks for the chance to win and happy holidays!! oliver and my favorite Christmas movie is miracle on 34th st.
My favorite Christmas film is A Christmas Story. The title of Amy Rose Bennett’s story in Mistletoe, Marriage, and Mayham is All She Wants For Christmas. The hero’s name is Jasper Hargreaves, Lord Arlington. My favorite Christmas Movie is White Christmas…it’s all about Bing in the holidays. The tile of the hero is Jasper Hargreaves, Lord Arlington….thank you for the contest. The winner of the perfumed frame and cameo is LoriH. Thanks to all who entered! Happy holidays to all!